I remember talking to a friend Martin Holder some years ago and he told me about somone he knew who bought two books from a prop sale. The books had been used in the Jason King TV series and they two Mark Caine paperback novels, which were nothing more than ordinary paperbacks with custom covers stuck on them. I would think that Venus, Our Sister Planet was nothing more than a custom dustjacket put on a standard book, that was probably already in the props department at Elstree Studios. I've started working on a rough layout for the dust jacket It's pretty basic. It still needs the edge of the white planet to be slightly blurred and some tweaking to the text (which looks like it should be a very pale blue) but that's pretty much it done. The Venus laser gun always reminded me of the Johnny Seven gun I used to have as a kid. 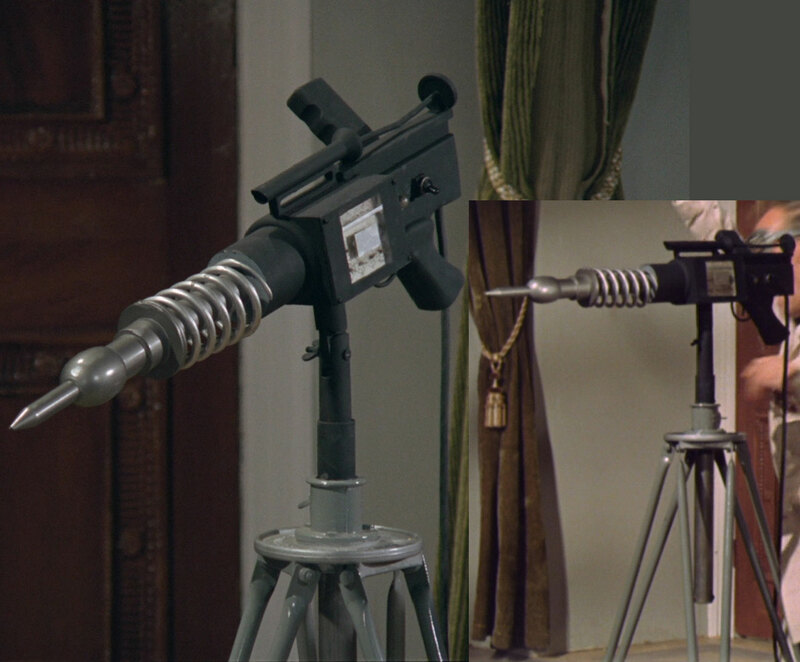 It probably was a Johnny Seven gun originally The Amnesia gun used in TFMK was almost certainly a converted plastic Lonestar James Bond Lugar pistol. In reality the back of the laser looks like it's an 8mm movie camera. Bottle of beer, surely? 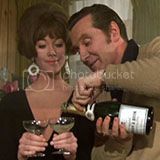 I think only old Sir Freddie Hadders had whiskey. I'm pretty sure that a full scale, accurate replica of this laser gun can be built from household junk. Here's what I've cobbled together thus far after a quick rummage through the garage and the bin. Looking great! I think the original was probably an off the shelf toy gun that they chopped up and glued a lot of pieces to - the trigger and grip look like hey're from an M16. I think the grip and back end section is actually a Chinon 8MM movie camera. I think you may be right re: the gun handle and trigger Piers. I just thought it looked terribly thick in the larger image to be a gun handle. It struck me as more in tune with an 8MM movie camera facing backwards. Finding this nozzle piece has been an absolute nightmare. Then I cut a 3rd piece from hard foam and sandwiched that between the hardboard shell using Apoxy Resin. Did the same for the hand grip.